With defending champion Panathinaikos and Aris eliminated from the Euroleague a day earlier, Olympiakos became the country’s sole team to reach the premier European club-level basketball competition’s quarterfinals following a 72-63 victory against visiting Real Madrid last night. The Spanish team was eliminated, ending third in the Round of 16’s Group F. Olympiakos, which captured the group’s second spot with a 4-2 record, will meet Group G winner CSKA Moscow, a favorite for the title, in a best-of-three quarterfinal series. Holding the home-ground advantage, the Russian club will play the first and third game – should it be needed – at home. Panathinaikos coach Zelimir Obradovic, in an initial assessment of his team’s failure to reach the Euroleague quarterfinals, said his players did not show the experience that was necessary. The Athenian basketball club was deprived of the chance of defending its European title after being beaten 82-73 by Partizan in Belgrade. The defeat left Panathinaikos a disappointing third in the Round of 16’s Group D with a 3-3 record. Siena and Partizan advanced from the group to the quarterfinals with 4-2 records. Obradovic blamed the defeat on a lack of cool heads in his big-budget team as well as a lack of tall men to win rebounds and force the play inside the key. Partizan won 37 rebounds compared to Panathinaikos’s 18. “We lost the game on offence because we missed three times in crucial moments,” said Obradovic. “Panathinaikos has experienced players and I expected smarter, more patient play from them,” he continued, adding that the team had a huge problem in the power-forward position. Playing in Group E, Thessaloniki team Aris ended its campaign with a morale-boosting 83-74 home win over Lietuvos Rytas. Both teams were eliminated with 2-4 records, with Tau Ceramica and Fenerbahce gaining quarterfinal places from this group. Sidelined basketball star Sofoklis Schortsanitis, a pivotal member of both Olympiakos and the Greek National Team until he fell out of favor because of severe weight problems, has returned to Greece following an undercover two-month spell in Switzerland, where the 2.06-meter center has reportedly shed about 22 kilograms. The news of the player’s return was made public by Olympiakos’s recently appointed coach Panayiotis Yiannakis, who has worked with Schortsanitis on the National Team, during a news conference following a league game on Sunday. Schortsanitis, who still needs to regain fitness to compete, will continue his recovery here. Yiannakis requested that the player be left in peace, which he stressed was crucial for the completion of Schortsanitis’s comeback plan. Club officials hope he will be ready to play again late next month, which would be in time for the league playoffs. Reigning European basketball champion Panathinaikos will look to capture the top spot in the Round of 16’s Group D tonight when the Athens basketball club hosts group front-runner Siena. The Italian club leads with a 3-1 record with two rounds remaining. Panathinaikos and Partizan share second place with 2-2 records. Also tonight, Olympiakos, on 2-2 in Group F, a win behind leader Real Madrid, is hosted by last-placed Zalgiris, on a 1-3 record. Just days after he took on troubled Piraeus basketball club Olympiakos as an additional coach, Panayiotis Yiannakis appears likely to be forced from his job with the national team following federation objections. The federation has raised concern about the dual role on the grounds of conflicting ethics standards. Yiannakis, a European basketball great who has led Greece to European titles both as a player, in 1987, and as coach, in 2005, assumed his club-level job in pursuit of more regular challenges than those offered by the national team’s more sporadic agenda. 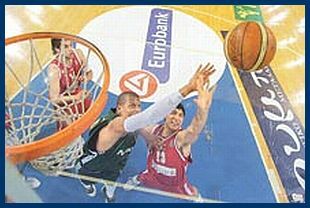 Giorgos Vassilakopoulos, the chief of FIBA Europe and a member of the Greek federation’s board, has expressed concern about the possible effects of Yiannakis’s ties with the national team’s squad should he, as Olympiakos coach, be verbally abused by fans of archrival Panathinaikos, whose ranks include a considerable number of Greece internationals. The rivals meet in the Greek Cup final on March 29. Up until a year-and-a-half ago, Yiannakis held concurrent coaching posts with the national team and the less prominent Athens club Maroussi, where the prospect of controversy was not an issue of concern. Greece takes part in the Olympic qualifying tournament this July. It remains unknown whether Yiannakis will still lead Greece. Greece basketball coach Panayiotis Yiannakis has taken over the helm at Olympiakos in place of Israeli Pini Gershon, the struggling Piraeus team announced last night. The deal, it said, will run through the summer of 2010. Yiannakis, a monumental figure in Greek basketball, both as a player and coach, will also continue coaching the men’s national team, which he has successfully led since 2005, following a less impressive first tenure between 1996 and 1999. Gershon’s days at Olympiakos looked grim following successive defeats against PAOK in the domestic league last weekend and Montepaschi Siena in the Euroleague on Wednesday. “I always say that you pay the coach money to have somebody to blame in defeats,” Gershon, sensing his end, declared after the Euroleague defeat. Olympiakos scraped through to the competition’s second stage. “We have a great administration and if they think that there is someone who can do the job better than me, then that’s OK,” continued the Israeli who led Maccabi to two Euroleague titles before joining Olympiakos. Posted by grhomeboy in Basketball, Olympic Games. Greece coach Panayiotis Yiannakis will be hoping his team benefits from vociferous home support at the Olympics qualifying tournament in Athens, July 14 to 20, where 12 teams will vie for three remaining berths. Greece will need to overcome Brazil, a formidable force in international basketball, for a place at the Olympic basketball tournament in Beijing, following a draw held in Athens yesterday. The men’s national team is among 12 contestants that will battle for three remaining Olympic berths at a qualifying tournament to be held in Athens from July 14 to 20. Nine teams have already booked their places. Besides Brazil, Greece will face Lebanon, on the opening day of play, in Group A. Group B consists of Cape Verde, New Zealand and Germany. Korea, Canada and Slovenia were drawn into Group C, and Cameroon, Puerto Rico and Croatia into Group D.
The top two in each group will advance to the quarterfinals. The winners will go to the semifinals and the two winning semifinalists will qualify for the Olympics. The losing pair will clash for third place and the other berth. Nine teams have already qualified for the men’s Olympic tournament, August 10 to 24, at the Beijing Games. Angola advanced as African champion, Argentina as Americas runners-up, Australia as Oceania champion, China as host, Iran as Asian champion, Lithuania as the bronze medalist at the Europeans, Russia as the European Champion, Spain as World Champion, and the USA as Americas Champion.